​Who is the Patron Saint of Police Officers? Angels are mentioned many times throughout the Old and New Testament — from when God revealed the Ten Commandments to Moses and said, “Behold, I send an angel before you to guard you on the way and to bring you to the place that I have prepared," (Exodus 23:20-21) to when the angel Gabriel delivered the message to the Virgin Mary that she would carry the Son of God, and beyond. "from its beginning until death, human life is surrounded by their watchful care and intercession. Beside each believer stands an angel as protector and shepherd leading him to life." ​While there are countless angels, Gabriel, Raphael, and Michael are the only angels referred to by name in the Bible. These angels were each entrusted with extraordinary missions and played a specific role in how our salvation would play out. St. Michael, also known as an archangel (an elevated angel), is called “Prince of the Heavenly Host,” and is considered the leader of the angels. 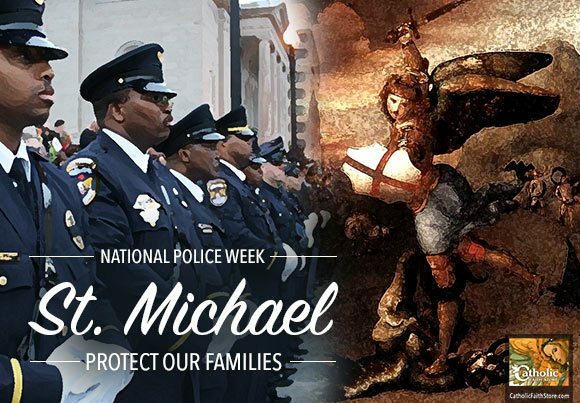 ​As a police officer's role is to protect the public from the activities incited by the devil it is absolutely natural that Saint Michael is the Patron Saint. ​is often prayed at the end of mass and holds special meaning for those in law enforcement. The prayer came about as a result of a disturbing vision Pope Leo XIII received in 1884. After celebrating mass, the pontiff was seen staring at something in space for a period of time with the look of horror on his face, when he suddenly collapsed. Those around him feared he had died, but the pope regained consciousness and was said to have retreated to his private quarters where he wrote the St. Michael prayer. Pope Leo XIII never revealed exactly what he saw and therefore, historians aren’t exactly sure what the vision exposed. Based on the words in the prayer, however, it’s clear that he saw a vision of some sort of evil and destruction. One version of the vision is that he heard a conversation between God and the devil, in which the devil said that he could destroy the Church if he had time and power (75-100 years). Another account indicates that the pope saw a vision of the devil and other evil spirits trying to decimate the Church, and then seeing St. Michael intervening and ultimately triumphing over Satan and all his evildoers. Although we don’t know what horrific images Pope Leo XIII saw or voices he heard, it is a reminder to all of us that the dangers of evil constantly surround us. We must never take God’s protection for granted; we must constantly ask for His saving hand to guard us. 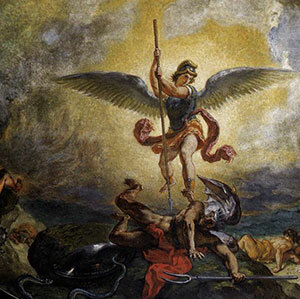 God also sends us St. Michael to be our intercessor against all that is wicked. ​This powerful prayer is often said by police officers to shield them against the many dangers they face in their line of work. Whether it’s in the form of a prayer card, medal, or car visor clip with the image of St. Michael, many law enforcers have found security and peace in carrying this saint with them. Giving the gift of a St. Michael devotional item to someone who works in law enforcement is a touching way to bring them the peace and comfort in knowing that they’ll have a warrior and “The Prince of the Heavenly Host” by their side. ​Do you have a cop in your family? Do they carry Saint Michael around with them whenever they are on Duty? Have a story of Saint Michael protecting an Officer? Please a little information about St Ursula. Her feast day is Oct 21st on the older Catholic calendars. There is an order of nuns founded by St Angela Merici The Ursuline nuns. There are the steps of St Ursula in Sardinia. So a little info please. It’s my daughters name also. The Catholic Church has rotting roots and the disappearance of saints from the calendar, the loss of the St Michael the Archangel prayer after mass and the general secularization of the church since John the 23rd and Paul the 6th started its death knell. Sorry but I’m not the only Catholic who feels this way. Also we have daily Mass at our church and the rosary is recited 1/2 hour before the Mass begins and I can tell you for a fact that we say the St. Michael the Archangel prayer everyday at the end of the recitation of the rosary! Also our church that I attend is not secular. You can’t judge all the Catholic Churches as being secular because they’re not. You just have to find the right one that puts Jesus Christ head of it and honors the sacraments! Regarding St. Ursula I would find a good Catholic Church and go to the Pastor and ask about your concern and even if you have to go to Bishop of your Diocese or even Pope Francis. I’m sure you will get your information. I’ll be praying for you that you get peace of mind about your concerns especially because your daughter is named after Saint Ursula. I hope this helps. ? Thankyou so much man I was very very inspiring and inspirational wording that you used God bless you and may the holy spirit guide you and direct you can always send Miguel the archangel will always watch over us and protect us . we have to be the first to write about our faith in God and the truth. When the truth speaks the truth listens.